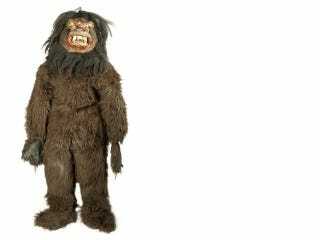 If any of you io9ers happen to be in London on the 18th, it's time once again for the Bonham's Entertainment Memorabilia Auction, which contains 55 lots of costumes and props from both Doctor Who and Torchwood, including the Taran Wood Beast costume from The Androids of Tara, arguably one of the worst monster costumes from the entire 50-year history of the show... and possibly the most infamous, if you believe the longstanding rumors they butchered the 3rd Doctor's pal Aggedor to make the poor dumb critter who was only on screen for a couple of seconds. Other noteworthy props include two of the original Yeti homing beacons from The Web of Fear, a destroyed Dalek from Remembrance of the Daleks, Sharaz Jek's head cowl from The Caves of Androzani, and a complete set of hand annotated draft scripts for The Abominable Snowmen. While the Taran Wood Beast is expected to go for anywhere between £1500 to £2000, if past auctions are any indication, these "least loved" monsters often end up going for a steal. A lightly used Kandyman went for £1920 a few years ago, Mestor for £1200, a Nimon for only £456, and a trio of Plasmatons (hands down the crappiest Who monster ever, for more reasons than one) went for just £480.